If you’re ready to shake off those winter doldrums and step out, we’ve got the perfect destination for you. 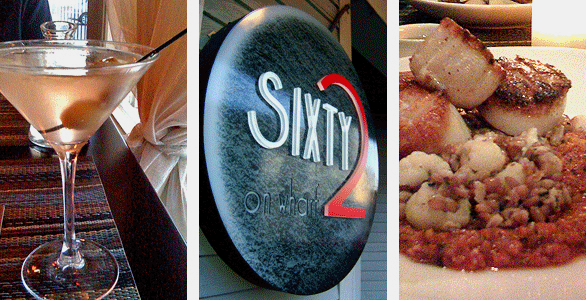 We had a superb meal last night at Sixty2 on Wharf, the latest addition to Salem’s Pickering Wharf. We found the décor, the food, and the service spot on at this chef-owned restaurant featuring Boston-quality Mediterranean cuisine. We were warmly welcomed by the host and seated in the cozy dining room featuring an unusual cork floor, stylish black tables, and inviting red walls. The menu starts off right with a large selection of antipasti, all of which are $5. (We’re already plotting a return for a night at the bar sipping cocktails and sampling the small plates.) We discussed our options over a glass of white cote de rhone and a dirty dirty martini. The wine ($10) was a generous pour served in a carafe, and the martini featured Grey Goose and gorgonzola-stuffed olives. Our appetizers set the tone for the meal—visual appeal, layers of flavor, and perfect texture. Fresh milk mozzarella was served in coin-sized medallions with crisp baguette slices and pepper jelly on a beautiful piece of gray slate. Polpettes were small balls of porky goodness, easily enough for two to share. For entrees, we went with the night’s pasta special, gnocchi with oxtail, and the sea scallops with romesco sauce and farro. Our waitress was a gem who seemed genuinely happy to be serving us and had an extensive knowledge of the menu and wine selections. We explained that we wanted a light red to go with the scallops and were happy with the pinot noir she recommended. The scallops ($25) were large and succulent with a wonderful crunchy sear on the outside; they combined well with the earthy farro. The hand-made gnocchi were also a highlight—moist and feathery light. The only thing off key was the oxtail, which was quite chewy. The mozzarella and gnocchi were part of the $22 Neighborhood Nights three-course prix fixe menu, a fantastic value currently available on Tuesdays, Wednesdays, and Sundays. To end the meal, we indulged in the toffee pudding and the brown butter tart. Both were worth the calories, but the unusual flavors in the pudding and wonderful softly whipped cream really sang. It’s easy to understand why the Boston Globe named Sixty2 best new restaurant on the North Shore, and we were pleased to see a good-sized crowd on a Tuesday night, since pricier restaurants sometimes struggle to fill seats in times like this. But it’s clear the locals have caught onto the symphony of flavors chef Tony Bettencourt and his crew are serving up. save a lot of money. Learn more aout which get paid for taking surveys potentials you can gain from the a large number of. doesn’t take much of an investment of money. Many home sourcing employers not only prefer but require that employees live in the area. Typing, answering phone calls and emails, scheduling travel plans, and bookkeeping are a few of the many varied tasks a virtual assistant may need to perform.